UNHCR Spokesperson Duniya Aslam Khan on Tuesday said first group of Rohingya refugees started moving to new emergency shelters erected by the agency next to the Kutupalong camp near Cox's Bazar, reports BSS. 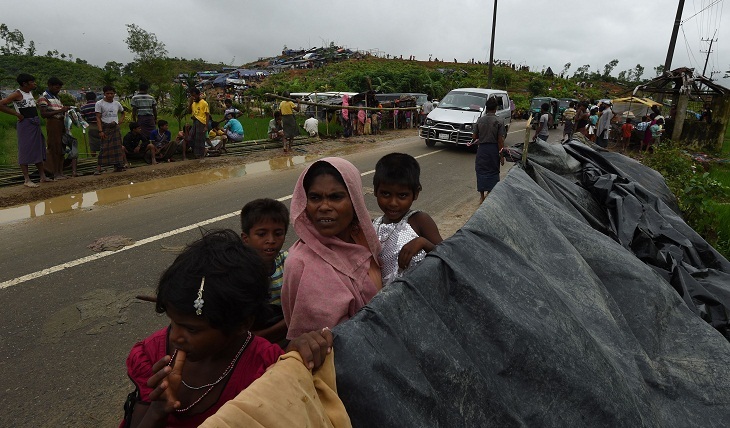 "A main focus of our work over the weekend and yesterday was at a new Extension Site next to the Kutupalong camp near Cox's Bazar where on Sunday and Monday we began moving people who have recently arrived into family tents and temporary communal shelters," she told a press briefing at the Geneva office, according to a media release of UNHCR. Khan said the government has allocated some 2,000 acres [810 hectares] for the refugees. "UNHCR site planners estimate this will be sufficient to house 150,000 or more of the 415,000 refugees who have arrived since August 25," she said. The UNHCR spokesperson said four communal tents were erected, sheltering some 400 people. She said as of yesterday afternoon, refugee volunteers had erected 70 large family tents, each accommodating two or three families of up to 21 people. UNHCR, the UN Refugee Agency, has been continuing to ramp up operations, she added. This is in light of further arrivals of Rohingya refugees and our very grave concern at the still difficult conditions for the many thousands of people who have fled Myanmar's Rakhine State since August 25th. "Refugees have told our staff that they suffered from cold and rain during their treks from Myanmar. Many had fallen ill, particularly small children," she said. She said there is urgent need for more latrines, not least to reduce risks of a spread of disease with so many people living in close quarters. "Many also complained of hunger and said they had eaten little on their journeys, which took up to 10 days on foot," she added.